Have you ever been in what could be described as a ‘toxic relationship‘? At the core of these types of relationships we discover a common denominator: lack of trust. The key to resolving toxicity and making this type of relationship work is to resolve the trust issues. In order to do that, both parties have to be willing to do the work. Where both parties are willing to do the work, there is potential for the toxic couple to flourish into an unbeatable duo who pull their strong wills together and use their passion for each other to take on the world instead of trying to destroy the other person. 1a. 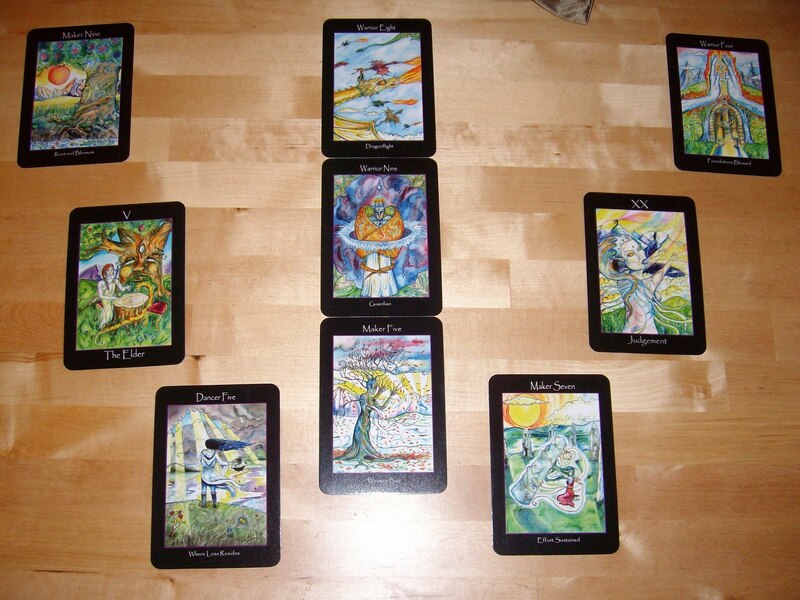 Past issues for partner A – Maker 9 (9 of Pentacles) Root and Blossom: This person was not able to put roots down in the early years. It is possible that A moved around a lot and went to a few different schools. A still struggles with being self-sufficient and to provide for their own physical needs to some degree. She also suffers from feelings of low self-worth, as if she doesn’t deserve all the good that life has to offer. 1b. Past issues for B – Warrior 4 (4 of Wands) Foundations Blessed: A blighted, unsupportive and aggressive (lots of beatings) home environment during childhood and adolescence makes it difficult for B to trust people in general. He has suffered from long periods of homelessness and moving like a hobo from place to place. 2a. How A holds B at gunpoint – V The Elder: She tries to change B by ‘teaching’ him how things are done. She often sounds and comes across as having more knowledge, and she uses this to bludgeon her partner into submission. 2b. How B holds A at gunpoint – Judgement: B is very critical of A. He picks on things and likes to hold onto past grudges. He also has a tendency to see things as either black or white, forcing a fiery finale when things don’t go his way. 3a. Why A doesn’t feel she can trust B – Dancer Five (5 of Cups) Where Loss Resides: She feels abandoned by B (he literally did leave her at a time when she was vulnerable and in need of support) and it triggers old abandonment issues within herself. This in turn, makes her lose the ability to detach. She goes into reactive mode and lashes out. 4. Higher reason for coming together – Maker Five (5 of Pentacles) Winter’s Bite: From the perspective of the Higher Self, these two souls have chosen to get together under conditions of hardship and loss to see if they can learn and grow together. Quite synchronistically, their dramatic split happened during the winter months, shortly after the loss of their baby. They could have turned to each other for comfort but instead they turned on each other. 5. What it would take for both people to drop their guns and call a truce – Warrior Nine (9 of Wands) Guardian: They need to learn to respect their own and each other’s boundaries. Learning to respect Self is always the first step. This will take a lot of work for these two souls who both lacked role models for respect growing up. A mistakes ‘instruction’ with being helpful (makes B feel belittled) and B mistakes ‘withholding’ with keeping the peace (makes A feel abandoned). 6. Most likely outcome – Warrior Eight (8 of Wands) Dragonflight: This would continue to be a passionate, even combustible, relationship but if they can make all the arrows fly the same way… There is a lot of power and potential here! If respect can be maintained the attraction would never fade.